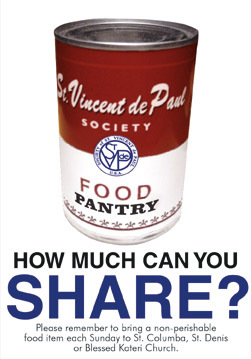 The Society of St. Vincent de Paul is an international Catholic organization of lay men and women who seek, in a spirit of justice and charity and by a person-to-person involvement, to help those who are suffering. 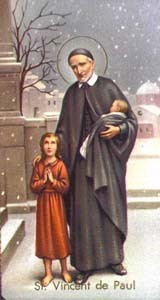 Dear Saint, the mere mention of your name suggests a litany of your virtues: humility, zeal, mercy, self sacrifice. It also recalls your many foundations: Works of Mercy, Congregations, Societies. And the Church gratefully remembers your promotion of the priesthood. Inspire all Charitable Workers, especially those who minister to the poor - both the spiritually and the materially poor. Amen. We thank all the parishioners who respond so generously. Without this wonderful help, we could not meet the needs of our less fortunate neighbors.